Published: Sept. 24, 2013 at 03:25 p.m. Updated: Sept. 25, 2013 at 06:25 a.m.
You could ask him, but let's face it, he probably won't give you much. Kaepernick is not a verbose man -- at least in typical conversation with media folk. Luckily, the world of Twitter offers us another glimpse into the internal hard-wiring of the San Francisco 49ers quarterback. Click into the "Favorites" section of Kaepernick's feed for messages from people with nothing but darkness in their heart for No. 7. 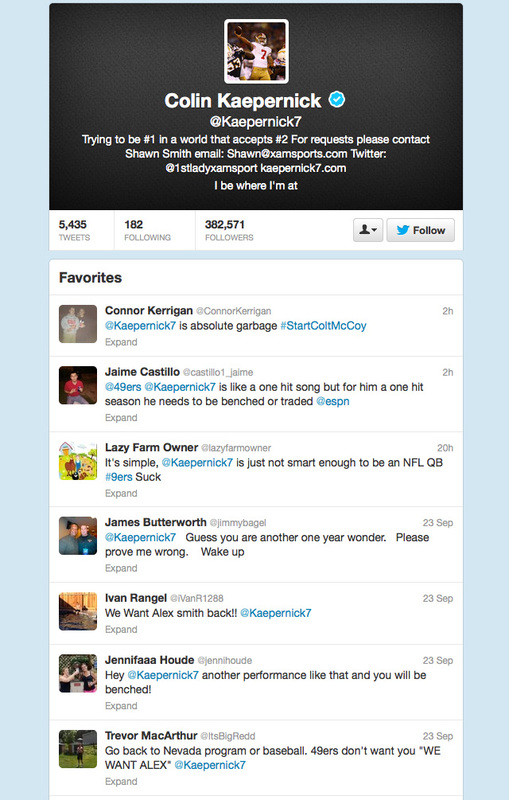 We assume Kaepernick is taking these slights and using them as fuel for success. Either that or he's doing the Buscemi thing from "Billy Madison," in which case, um, take it easy, Colin.